A recent British study echoes studies done in this country, published in the New England Journal of Medicine and the Journal of the American Medical Association (JAMA). These studies all say that high levels of Vitamin D and Calcium do NOTHING to help bone loss. Add this to the fact that Vitamin D is the only vitamin with IRREVERSIBLY toxic side effects, we should all take care not to take too much. 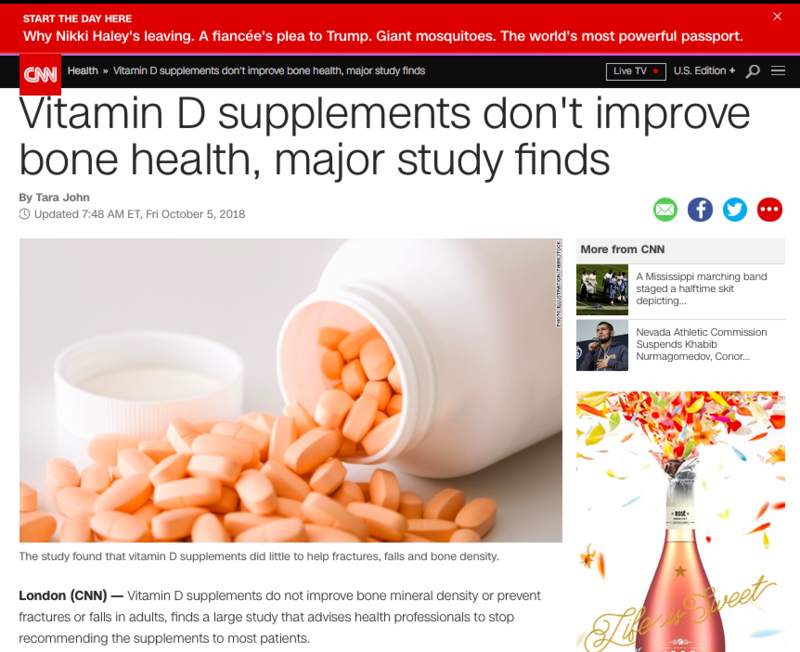 Medical doctors receive very little nutrition education and often recommend highly toxic amounts (50,000iu per week) of the WRONG TYPE of VITAMIN D (D-2). We find that light sun exposure and a good supplement of Vitamin D-3 at 1000iu per day is a safe and effective dose for most adults. Magnesium, other trace elements and our Bone Appetit® formula have shown to be helpful in REVERSING BONE LOSS. WHY IS REFINED SUGAR SO BAD FOR US? 3. High refined sugar intake raises insulin level, which can contribute to breast and other cancers. 4. High refined sugar intake can contribute to headaches, ADHD, concentration difficulties, depression and anxiety. 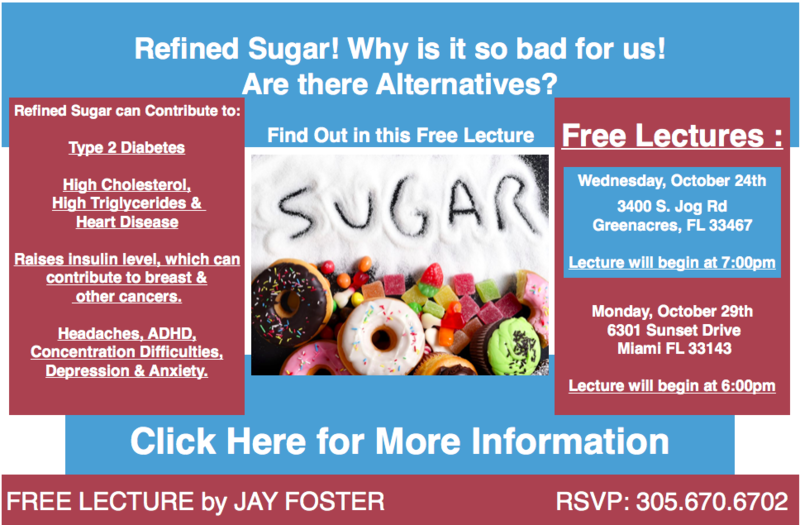 Join Nutritional Biochemist, Jay Foster in FREE Lectures in October, in Palm Beach and Miami-Dade County. 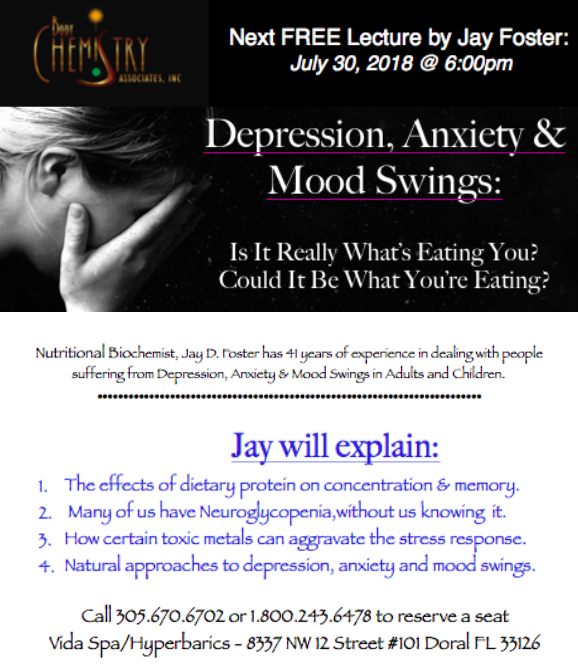 He will describe how sugar and carbohydrate intolerance can contribute to a wide array of symptoms that are commonly treated with prescription medications, as traditional physicians have little to no education in nutritional biochemistry. -How excess sugar and carbohydrate intake can contribute to many symptoms. Jay explains complicated biochemical terms in easy to understand and often humorous format. Both lay public and health care practitioners benefit from his lectures. arreata, where there are actual bald patches. If we had had the same success in men, I’d be a billionaire! 4. Mineral deficiencies, including zinc, copper and Vitamin deficiencies, especially Vitamin C.
In our BodyChem™ Program, we test for your individual nutrient and dietary deficiencies and make specific recommendations for you. 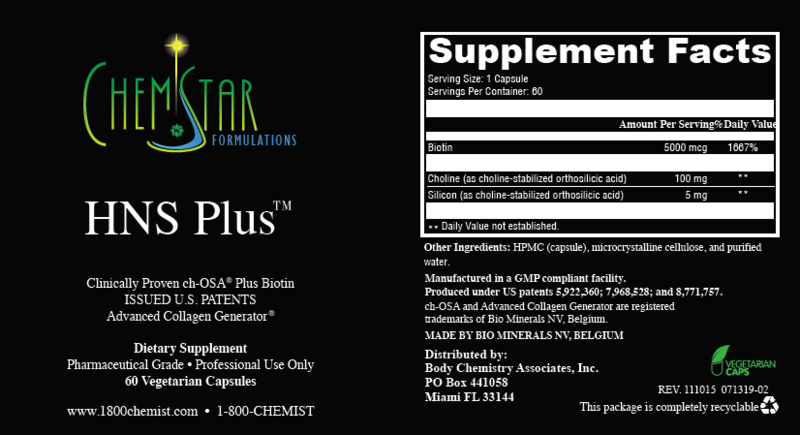 ch-OSA (choline-stabilized orthosilicic acid) that helps stimulate collagen production for hair, skin, nails and bone. Please call 1-800-243-6478 for further information. WHY DO WE NEED GOOD AMOUNTS OF PROTEIN IN OUR DIET? High quality protein is essential for normal brain function, hormone balance and energy needs. Dietary protein is the source for most all neurotransmitter production in the brain. These neurotransmitters are necessary for memory, concentration, healthy emotions and normal sleep. 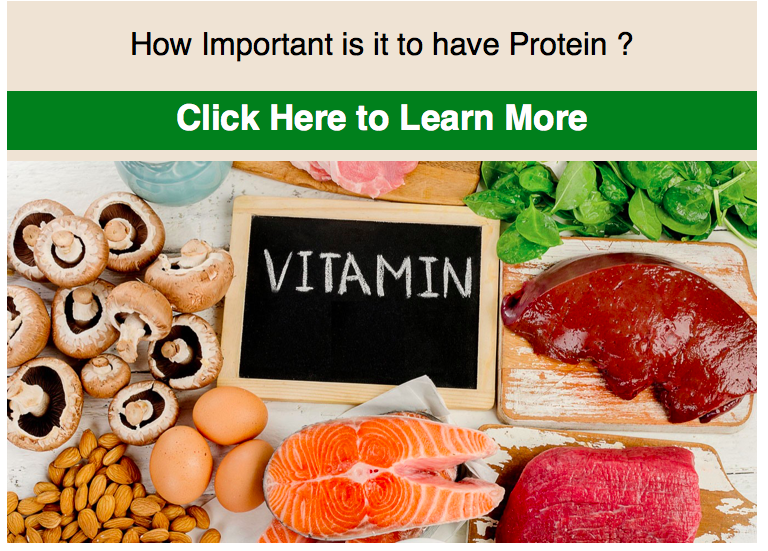 Some amino acids that are derived from protein are responsible for thyroid hormones, insulin, and hormones coming from the adrenal glands, pituitary and higher brain centers. Many people with low protein intake show problems with metabolism, moods, concentration and deficiencies that effect every cell in the body. High quality sources of dietary protein include: eggs, fish, seafood, fowl, and meats if desired. Most whey protein from cow’s milk also contains casein, which can cause inflammation and other health problems. Our STAR Protein is a high quality protein without casein. It is Malnutrition Awareness Week! Traditional physicians in the U.S. are taught that true malnutrition is very rare in developed countries, like the USA. However, we find that subclinical malnutrition runs rampant here. Subclinical basically says that your doctor may not recognize nutrient deficiencies, because of what they were taught and weren’t taught in medical school. Let’s take Vitamin C as an example. According to the Merck Manual, What are symptoms of scurvy, due to a Vitamin C deficiency? Symptoms include fatigue, depression, and connective tissue defects (like gingivitis, rash, internal bleeding, impaired wound healing). Do you know anyone with bleeding gums, depression or tiredness? Most doctors look for other reasons, because they are taught we get enough Vitamin C in our diet. Emerging research says that we are biochemically and genetically unique and some people may need more Vitamin C, B vitamins, Folic Acid than others to maintain optimal health. Some people need 1000mg Vitamin C, some may need 5000mg ascorbate or more. The same applies to B vitamins, Folic Acid and other nutrients. We test you for individual nutritional needs and biochemical imbalances. Once deleted, natural formulations and diet may make significant differences in your health and symptoms. 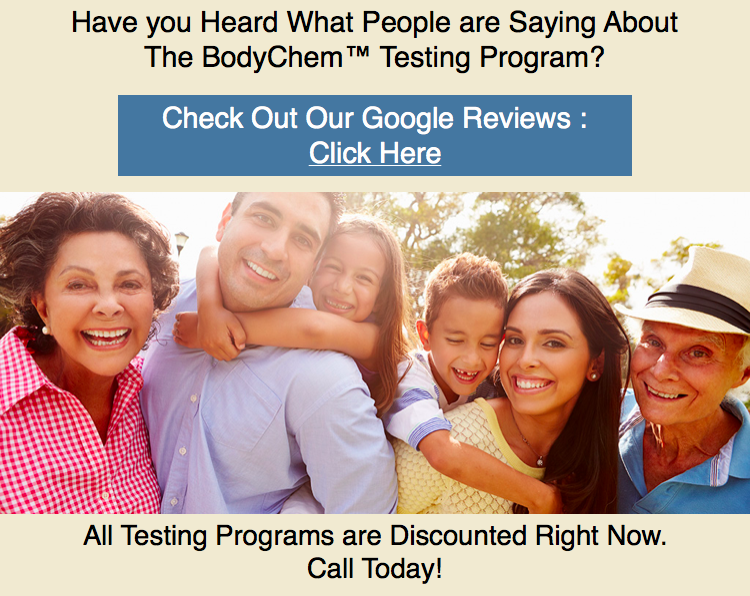 Call 1-800-243-6478 (1-800-CHEMIST) for more information on our BodyChem™ Programs of testing and natural recommendations that we have been doing since 1982.